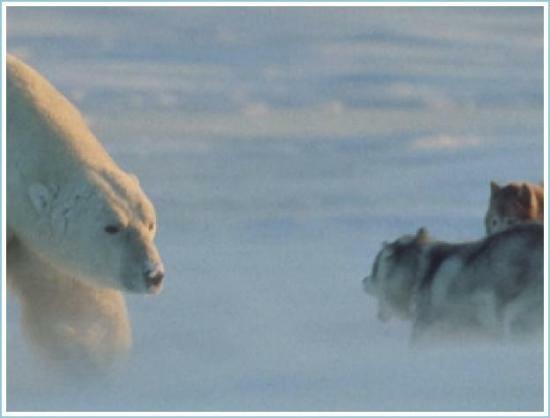 Stuart Brown describes Norbert Rosing's striking images of a wild polar bear �playing with sled dogs�near Churchill, Manitoba on�Canada's Hudson Bay. jeez--let them dogs off them chains! Yeah, kinda like bear bait. Me thinks, that is one horny, black bearina. Sled dogs are not pets. 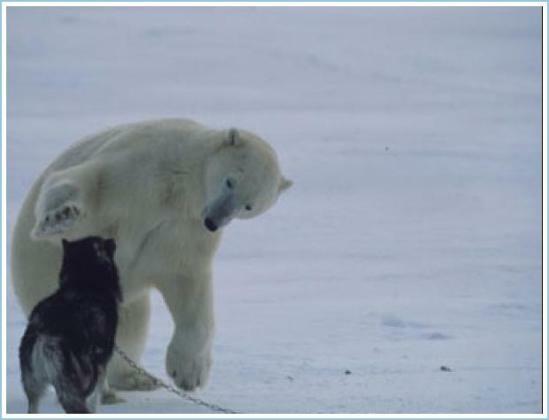 Perhaps, the very fact they are on chains is what influenced the bear to calm down. It is possible that if they were all off of their chains they would "Pack up" and cause a real defensive reaction. This way one on one, or maybe two to one the bear did not feel threatened. I dunno--just a guess. I've been to Churchill; this guy (Brian Ladoon) puts out candadian geese, rabbits, etc. so these bears are, in fact, "well fed" and pretty happy. He used to put out whale meat, too, until the authorities put a stop to that (eh)! So? You bought them, you raised them, you named them, you feed them, you trained them, you use them for hard duty on your behalf. Their purpose is to serve you, and you chain them to keep them serving you. Perhaps not a pet, but most definitely your responsibility. One of the survivor man shows on either Discovery or Science cable channel had on episode where the guy was with a sled team. Sled teams have to be chained not only to keep them from wandering off (chasing rabbits, say), but also to keep them from the fights that dogs find necessary to establish dominance hierarchies. Ye gawds. Lucky lucky dogs insofar as they drew the right bear, if not the right owner. I mean, would you be surprised if the caption continued "but that weekend, the bear changed his mind and ate the dogs" ? 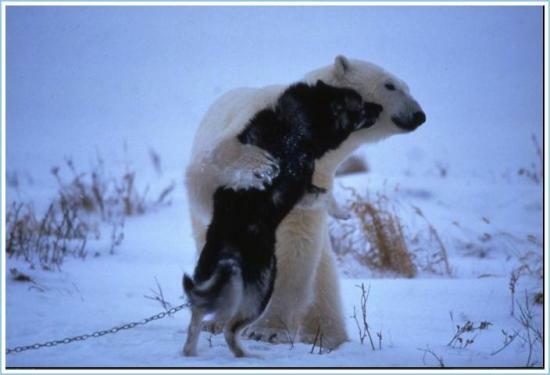 There must be more to the story--how could the dog owner count on the non-polar-bear behavior day after day visit after visit? 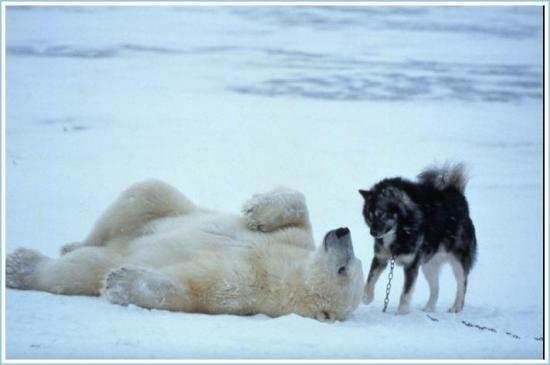 My husband [Downs Matthews] the nature-writer who has written several books about polar bears, says that the bear is probably a young bear and a well-fed one, so he wasn't at the moment viewing the dogs as prey. It would be another thing altogether if he were not well-fed. That said, Churchill, on the shores of Hudson Bay, is a favored bear haunt, while they wait for the Bay to freeze over so they can go out on the ice and hunt seals. While they're waiting, the bears hang around the town dump for food scraps. When they get bold enough to pester folks and threaten them, the wildlife people put them in the town's 'polar bear jail, 'until they accumulate enough of them to airlift them by helicopter back out on the ice. A big, full-grown male bear, by the way, stands 18 feet tall when he's on his hind legs with his nose stretched up. That's two stories high, folks. Nothing to mess with. The apex terrestrial predator, most likely. can't see a bengal tiger or african lion taking an adult down. could be wrong of course. Great photos. The bear and dogs look so cute. Might not be real smart to risk the dogs like that but it looks like the owner knew the set up. I have only seen polar bears in zoos and on pedestals. The old Davenport Hotel in Spokane had a big (12 to 13 feet) stuffed beauty in the lobby. Heard it was sold for cheap in the 80's or 90's when the hotel hit hard times. Really a shame as the hotel is nicely renovated and reopened now. I asked where the bear was and IIRC it may have gone to South Carolina. Maybe the dog that was disemboweled and still alive would have had a chance to escape before the attack if MR.LADOON had been a bit more of a responsible dog owner.